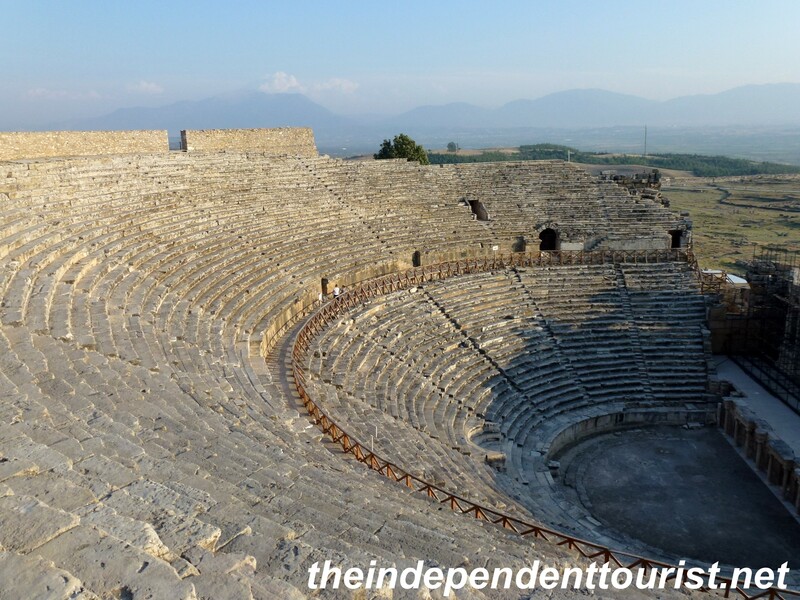 The theater at Hierapolis could seat 20,000. Put these sights on your “don’t miss” list in Turkey. 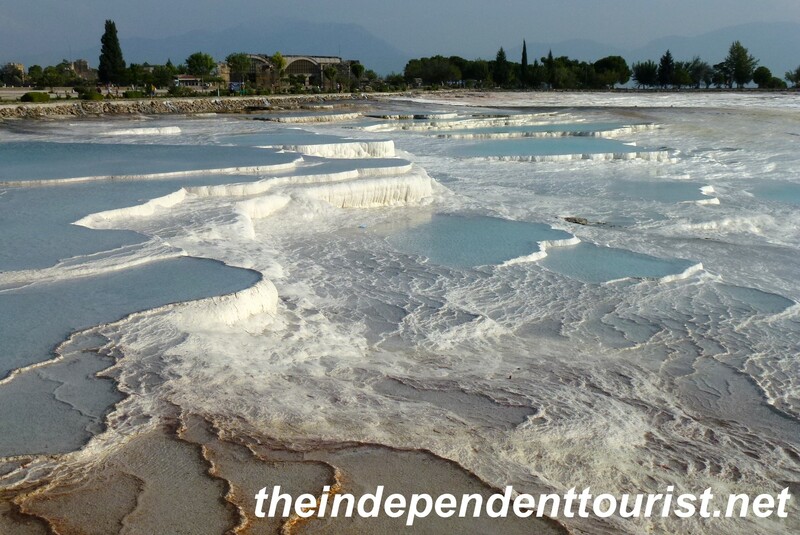 The combination of the ruins of Hierapolis and the terraces of Pamukkale, famous for the brilliant white travertine pools make this an unforgettable destination. Hierapolis was founded in 190 BC and became part of the Roman Empire in 133 BC. Later on it was part of the Byzantine Empire and eventually faded into obscurity in the 6th century. Among other things, it was a spa town known for its thermal baths, and the warm water still runs here. 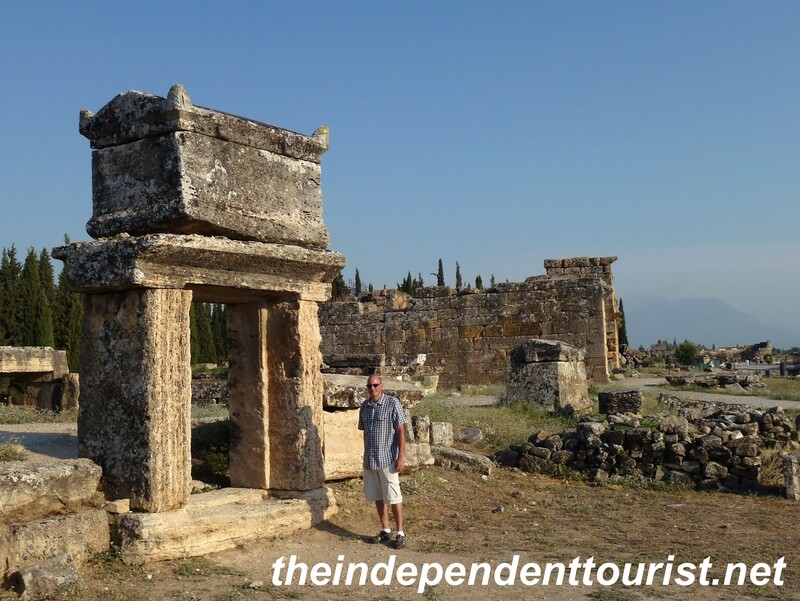 The northern gate to Hierapolis. An elevated tomb at the extensive necropolis of Hierapolis. The Nymphaeum – in ancient times there would have been fountains everywhere on this structure. This is near Pluto’s Gate. The “Gate to Hell” reference applies to a spot on the site known as Pluto’s Gate (Pluto was a deity of the underworld), and the lethal vapors bubbling up from the waters running underneath the city were used to sacrifice animals as part of sacred pagan rites, with hallucinating priests performing the ceremonies (not unlike Delphi in Greece). This spot was undergoing excavation during our visit in 2012, and a recent article confirms this historical reference. Also, it’s believed that the apostle Philip met his death here (by stoning and crucifixion) in AD 80. Frontinus Street – a main thoroughfare in Hierapolis. Swim in the warm waters among the ruins. You can swim among the ruins, and this water is the basis for the white travertine terraces, which are just at the edge of the ancient city on a ridge overlooking the town. 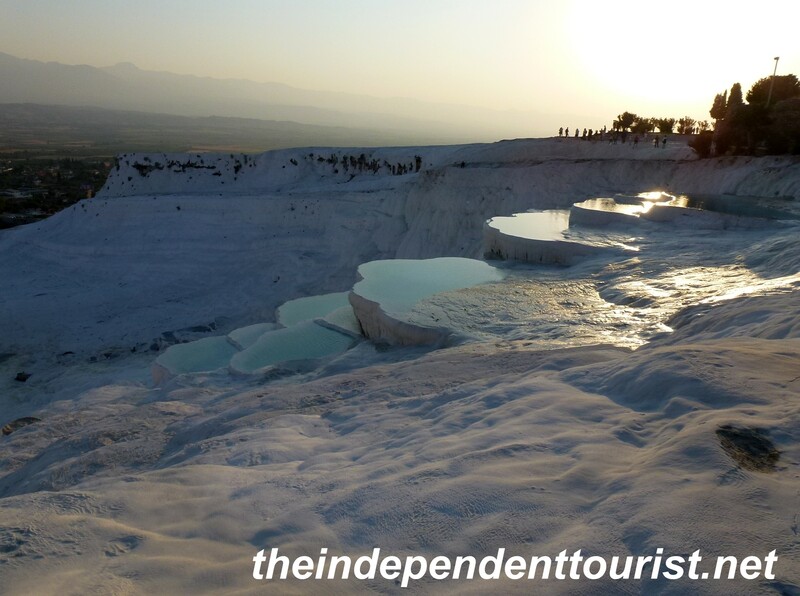 Pamukkale means “cotton castle” which is an apt description as you gaze at the terraces from below. The travertine terraces are formed from white limestone residue as the carbon dioxide escapes the water. 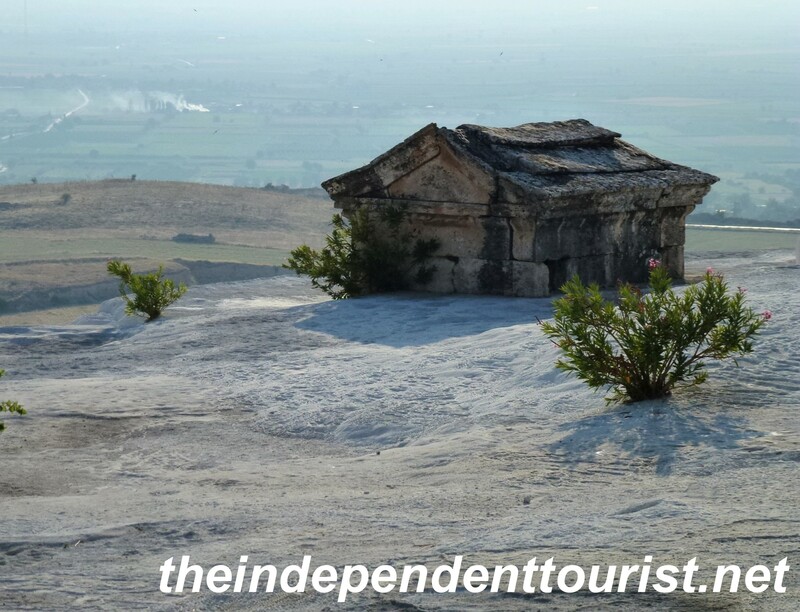 Where the ruins and travertine meet – this tomb is half-buried by the travertine residue. Some of the travertine terraces at Pamukkale. The setting sun reflecting on the travertine pools. 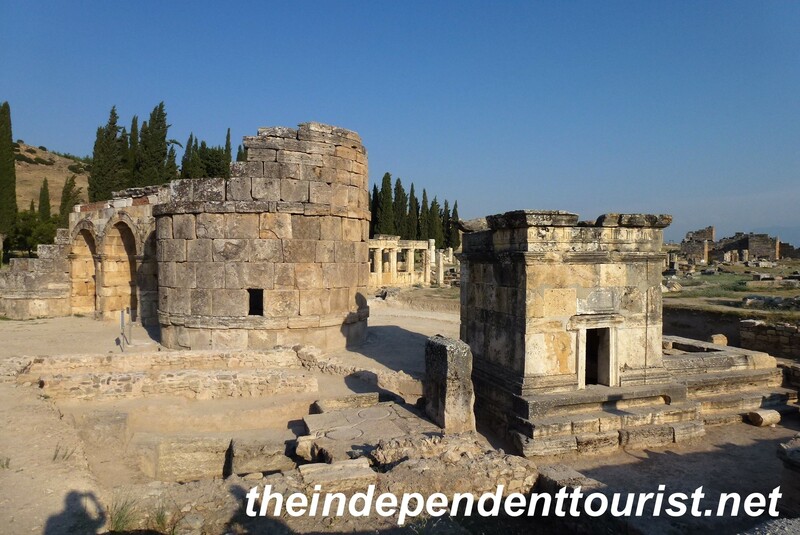 Visit the site in the afternoon (there is a parking fee of 5 TL and an entry fee of 20 TL per person (1.8 TL per USD) for both the ruins and travertine pools). By late afternoon the mobs and tour buses are leaving. We arrived about 3:30 pm (in September) and this was perfect timing to see everything and to watch the setting sun reflecting in the travertine pools. 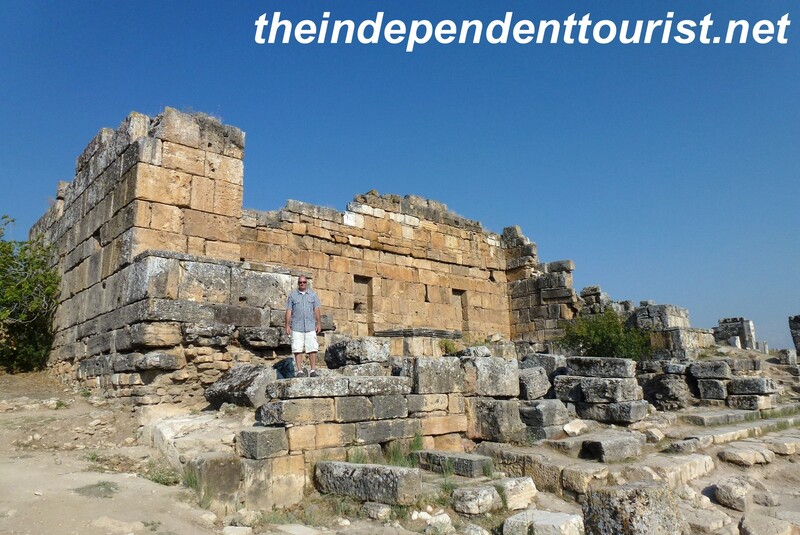 Keep in mind the ruins of Hierapolis are significant and spread out. Depending on your interest in ruins, you can easily spend 2-3 hours exploring. An ‘artificial’ section of the travertine pools are open for visitors to walk on. Plan to take your shoes off and roll up your pants. The water is warm and the surface is a bit slippery. Walking and wading in the pools. 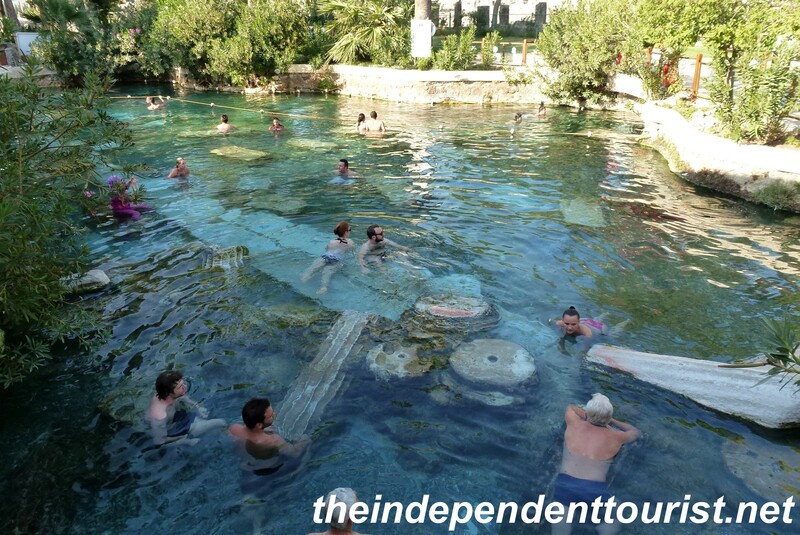 The thermal pool with the marble column ruins is expensive and requires a separate entry fee which is about $30 US per person. We skipped the swimming but enjoyed the ambience. There is a snack shop right there and you can enjoy the picturesque setting for the price of a soft drink. 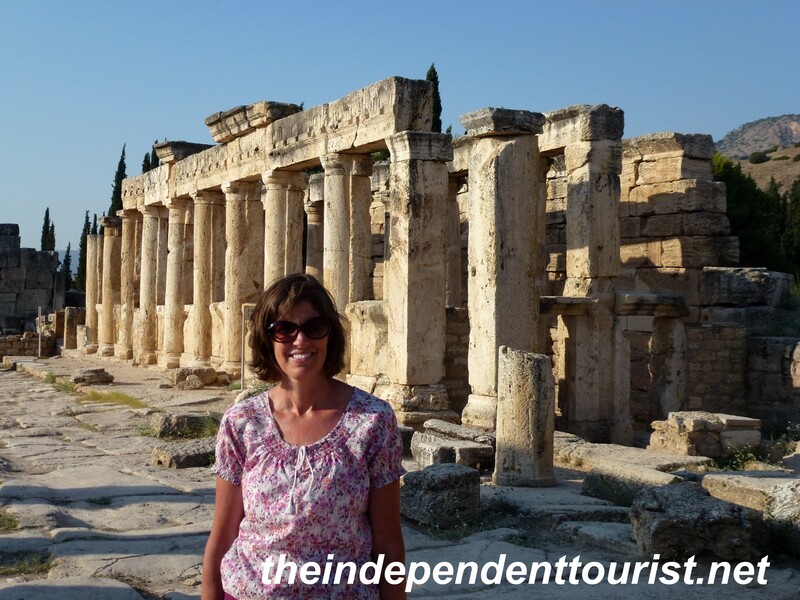 We stayed at the Hotel Venus in Pamukkale. It was an excellent small hotel, with a pool, nice large rooms, a very good restaurant and great breakfast buffet. It is just 5 minutes or so by car to the ruins. The room was €35 per night. Another excellent Turkish meal at the Hotel Venus, where we stayed. 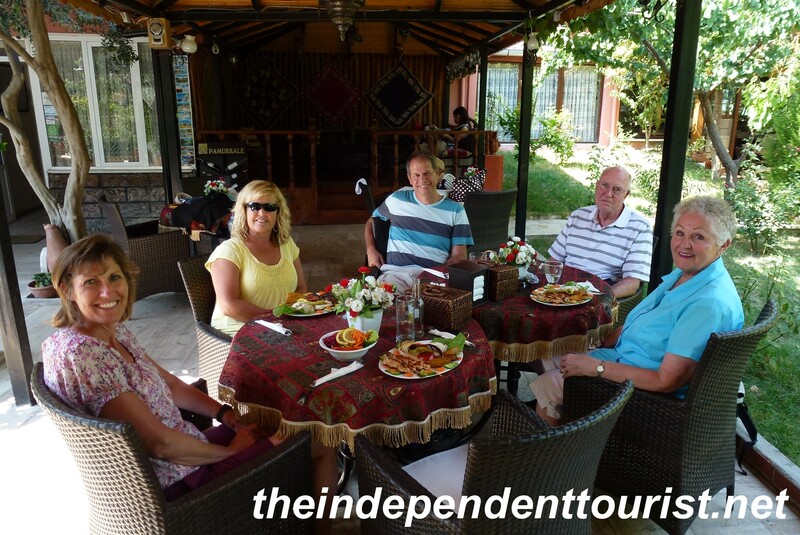 Pamukkale (which is about 15 km from the large city of Denizli), is a quiet little village and a great place to stay. The drive from Fethiye (on the south coast) took approximately 4 hours (about 200 km, on country roads). Also fairly close to these sights are the ruins of Aphrodisias, which I will cover in a separate post. References: DK Eyewitness Travel Turkey, 2008. Lonely Planet – Turkey, 2010. 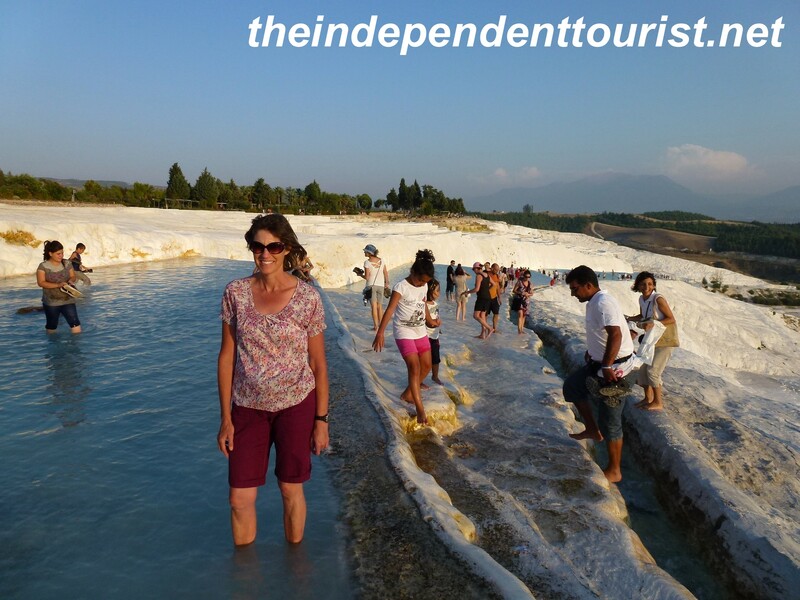 Posted in Turkey and tagged HIerapolis Turkey, Pamukkale Turkey, Travertine Pools Turkey, Turkey Travel on April 11, 2013 by Paul Terry.